The bodies were removed and the whole town watched as they passed by. The entrance of the Monongah mine where 362 men died. 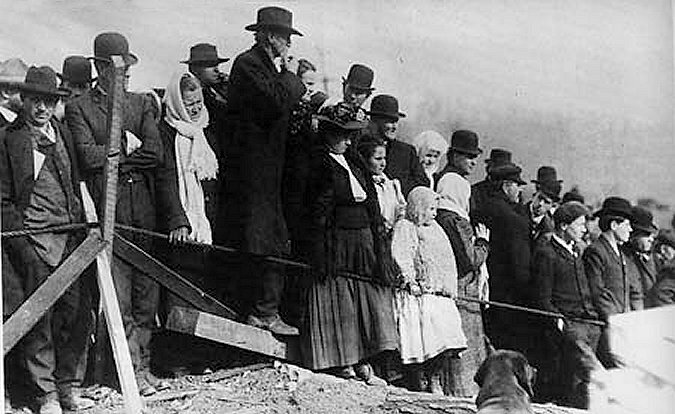 Men, women and children waited at the mine entrance for news of the survivors. 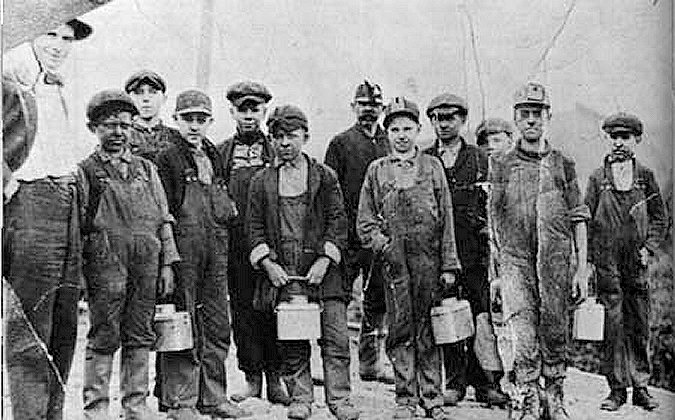 In the late 1800's children worked in the mines and were called breaker boys or slate pickers worked the mines for $1 to $3 a week. 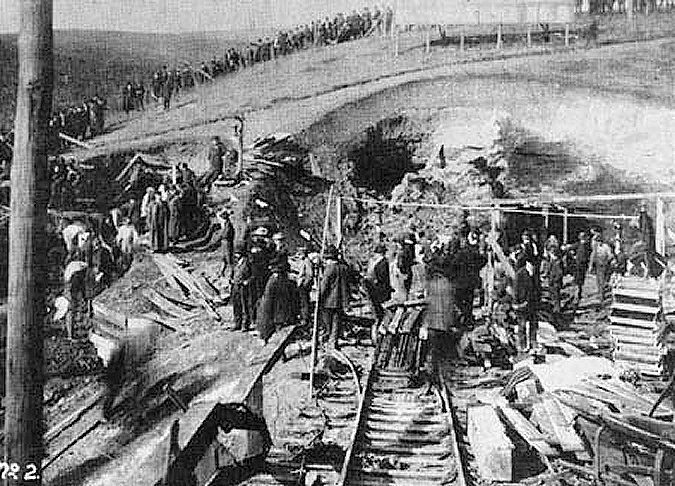 The worst mining disaster in American History occurred in the community of Monongah, West Virginia on December 6, 1907. Around 10 o'clock in the morning after a full force of 380 men and boys had begun their shift, mines number 6 and 8 of the Consolidated Coal Company shook from the impact of an underground explosion. A total of 362 men and boys lost there lives leaving 250 widows and over 1000 children without support. The mines were connected above ground by a steel bridge over the West Fork River and underground by a labyrinth of tunnels. An enourmous cave-in obstructed the main entrance of number 6 and above ground, the main opening was blocked by the wreckage from two strings of ore cars and two electric dynamo motors. The underground structure was twisted into a mass of rock, wood and metal. The explosion disrupted the ventilation systems causing an effluence of deadly gases to be trapped within the mines. Those on the surface concluded that the men and boys who survived the explosion and cave-in would soon succumb to the gases. The poisonous fumes permeated the mines causing rescuers to work in relays as they had no protective devises, such as gas masks and could only work in the deadly atmosphere for fifteen minutes before resurfacing. Some of the would be rescuers were seriously injured by inhaling the vapors and had to be taken away for medical treatment. Fires in mines number 6 and 8 created an additional hazard of smoke, and flames which increased the problems involved in the rescue attempt. The fire started on December 8th in the main entry of mine number 6 around midnight and the second fire started in mine number 8 shortly after 3 o'clock in the afternoon, delaying rescue work. Crowds gathered at the entrances of the two mines waiting for news about their friends and family trapped in the mines. The news was disheartening. Many of the bodies brought up were mangled and burned. 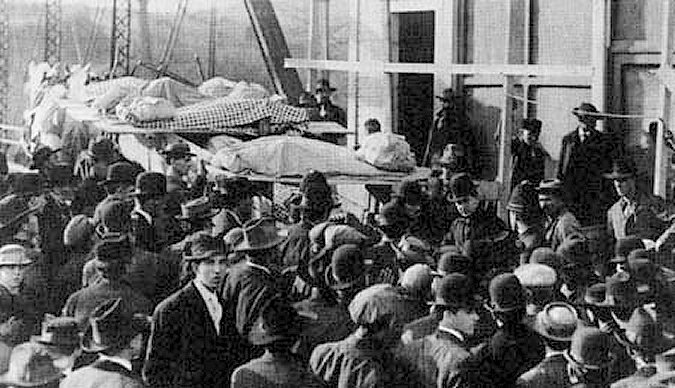 A temporary morgue had to be set up in a partially completed bank building to accommodate the victims. Bodies were identified by their personal effects and some were never identified. The explosion was thought to have been caused by the ignition of "black damp" otherwise known as methane. This in turn ignited the highly flammable coal dust, which is found in all West Virginia bituminous coal mines. 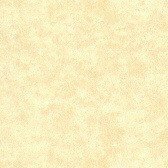 What ignited the "black damp" is unknown although two theories emerged, carelessness with an open lamp or a dynamite blast gone wrong. Thirteen days after the accident, an official Federal government report on mining accidents and deaths was released. On December 19th The New York Times reported that the government document said the number of accidents due to mining explosions had steadily increased and the cause of these accidents were often caused by of "lack of proper and enforceable mine regulations." Another contributing factor was the absence of information on the explosives used in mining and the proper conditions under which they should be used. In comparison to the increase in mining accidents in the United States, European mining accidents had steadily decreased and this was considered the result of government intervention in these countries. By 1908 the coal mine operators were starting to recognize that an unsafe mine was costly and unproductive. In 1909 the Engineering & Mining Journal stated that accident showed lack of efficiency and production in a mine and lack of productivity would result in lack of profitability and therefore the installation of safety measures would increase the profitability. Concurrently, the Progressive Movement, seeking economic, political and moral reforms turned their interest toward the coal mining industry. The Progressive Movement desired governmental regulations to improve working conditions in the mines. Mine operators hoped to stave off this government regulatory control by the implementation of their own safety practices. With the loss of more than 1000 workers in mining disasters, such as Monongah, between the years 1907-1909 Congress was pressured in 1910, to establish the US Bureau of Mines , an agency of the Department of Interior. The Bureau's responsibilities were to further research in mine safety problems and conduct mine inspections, but had little power to correct infractions. The Bureau functioned temporarily to satisfy both the Progressive Movement and the mine operators. For the Progressive Movement it exemplified a governmental involvement toward improving mining condition and for the mine operator it represented only a token amount of governmental control. This resulted in the establishing of some safety procedures by the mine owners, but these were minor and had little effect on the safety of the workers. 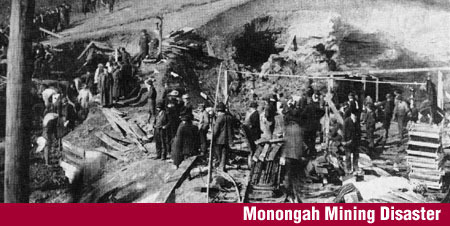 The mining disaster at Monongah increased the awareness of mine owners and the Federal government in the safety problems and lack of operational knowledge found in the mines. However, substantial changes in the system were not forthcoming. The Progressive Movement met with enough opposition to keep reforms to a minimum. The changes in safety procedures were time consuming and expensive. The mine owners made a token compliance and the Bureau of Mines had no power to enforce the regulations. For the men and boys that lost their lives at Monongah, the resulting changes were too little and came too late. Hofstadter, Richard,The Age of Reform (New York: Vintage Books, 1955). New York Times, 7-13 December 1907. Sloane, Howard N. And Lucille L. Sloane,A Pictorial History of American Mining (New York: Crown Publisher, Inc., 1970). Return to the Coal Glen Mine Disaster Home Page.